How is yogurt made to give maximum yogurt benefits to raw foodists? Once you know how to make yogurt, you can easily add yogurt benefits to your raw foods diet. You can use your knowledge of how yogurt is made to make and enjoy vegan yogurt also. The same basic instructions are used if you are using soy, rice or nut “milk”. On top of your stove, carefully bring your nut milk to about 115° F. This slow heating takes about 5 to 10 minutes. Use a candy thermometer to ensure this temperature and monitor the heating process carefully since you do not want to have your milk overheat then cool down. Any temperature higher than 115° F will not only affect the natural enzymes in the milk, but will also kill the bacteria in your culture or starter. Remove the milk from the heat and immediately whisk the commercial yogurt or yogurt starter into the heated milk. Pour the milk mixture into clean glass individual serving-sized containers or quart jars. Cover the tops of the containers with a plastic wrap. Place the milk mixture into your oven at about 100° F, your dehydrator at 115° F, or an insulated cooler. If you use a cooler as an incubator, I would add a few jars of very hot water to raise the inside temperature of the cooler. How is Yogurt Made -- Vegan Style? The two main differences between raw milk yogurt and non-dairy or vegan yogurt is only in the ingredients used. You can substitute soy milk, rice milk or any other type of nut milk for dairy raw milk. When using non-dairy milk, use a vegan yogurt starter. Follow the instructions for the appropriate ratios as per package instructions. Once you know the answer to the question, "How is yogurt made? ", you may be wondering about Greek yogurt. Greek yogurt is simply the outcome of an additional step in yogurt making. The resulting yogurt is called “Greek” or strained yogurt. The difference is that the Greek-style yogurt is much thicker than regular yogurt, having a consistency somewhere between yogurt and cheese. Nutritionally, Greek yogurt is higher in protein and lower in sodium and sugar. The straining process removes the excess salts and sugars. The higher protein content is because more milk is needed to make the same amount of Greek yogurt as regular yogurt. How is Yogurt Made -- Greek Style? Since this web page is about how to make homemade yogurt, it would be remiss not to tell you how to make Greek yogurt. Making Greek yogurt is simply an additional step to the above directions of how is yogurt made. After you have your homemade yogurt, simple place your yogurt in a cheesecloth-lined strainer over a bowl. Let it set out for about 24 hours at room temperature. The yogurt will continue to culture and will release the whey into the bowl. If you feel your home is too warm and you don't want the yogurt out in the heat, put it in the refrigerator. However, if it is refrigerated, the colder temperature will slow down the releasing process so plan on waiting about 48 hours instead of the 24 at room temperature. Remove your Greek yogurt from the cheesecloth and enjoy. Save the nutrient-rich whey for watering your houseplants. Yogurt making is an art, not a science. Sometimes you may have, for reasons unknown, a batch that will not “set.” Do not be discouraged. Here are some troubleshooting tips to ensure that your yogurt-making efforts are rewarded with beautiful and tasty homemade yogurt to complement your raw diet. Make sure that all of your equipment and containers are clean. Bacteria hiding in any crevice or surface can ruin your whole batch. I thoroughly wash all of my clean yogurt jars and equipment before making homemade yogurt. The live bacteria in the yogurt or yogurt starter is the answer to the questions of how is yogurt made. Therefore pay close attention to your good yogurt bacteria strains. 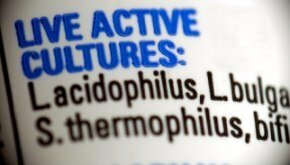 Look for a commercial brand of yogurt with as many different live and active bacteria types as possible. I use a brand with 6 different cultures. The fewer the strains of bacteria, the sharper tasting your finished yogurt will be. Experiment with different types of yogurt starters to get different types of finished yogurt. You can use some of your finished yogurt as a starter for you next batch of yogurt instead of a commercial yogurt. However, this only lasts for a few batches of yogurt. This is a good backup if you want to make homemade yogurt but don't have any starter handy. No matter which container you use as an incubator, let it set undisturbed for about 12 hours— don't peek! If you open the lid, the warm air will rush out leaving a much cooler inside temperature for your yogurt. Remove the finished yogurt to the refrigerator. Finished yogurt may not appear to be “set” until it is cold. Homemade yogurt will not be as thick or as solid as commercial yogurt. Store bought yogurt uses thickeners that you will not be using. When making Greek yogurt, expect your final yield to be about ½ of what you started with. The other half will be the liquid whey. You can either drink the whey yourself (it is a great smoothie addition) or use it to water your house plants. Yogurt benefits are more than a simply delicious compliment to your raw diet. Actually, the yogurt benefits are not that different than most other raw foods. Yogurt has all of the raw benefits with added beneficial bacteria. According to WebMD, the various strains of bacteria that are both “live and active” helps your digestive system while enhancing your immune system. The friendly bacteria may also help prevent yeast infections in women. Most people eagerly spoon up yogurt as a part of breakfast or as a dessert. Yogurt can be used to make smoothies, as a welcome addition to fruit leathers, layer in parfait dishes with raw granola and fresh fruit or for a raw and beautiful dessert. Use yogurt in place of buttermilk, sour cream or mayonnaise. Add seasonings and herbs and make a dip for raw crackers or fresh vegetables. Greek yogurt is tasty-topped with fresh fruit, honey, maple syrup and/or nuts. If yogurt making is too much of a bother, consider kefir, a close relative of yogurt. Learn how to make kefir and the health benefits of kefir.